The tourism industry encompasses a wide range of sectors and businesses, including the hospitality sectors of food and accommodation, transportation, travel agencies, as well as large parts of the leisure industry. As such, the industry’s growth potential is high and one of the possible drivers for the Japanese economy, reflected in the active efforts of Japan’s government to promote and expand this source of income. Even though domestic tourism in Japan represents the lion’s share of the tourism industry’s contribution to the gross domestic product, its chances to further prosper is limited and domestic tourist spending has even decreased since 2014. Similarly, the Japanese outbound travel market of which mainly travel agencies and tour operators benefit, has been somewhat stagnant: in 2016, more than 17 million people from Japan travelled overseas, more than in 2009, but less than in 2012, showing no major changes apart from slight fluctuations. Therefore, the country has strongly focused on inbound tourism for the past years, such as the easing of travel visa requirements on various countries or creating more airport landing slots and easier hotel building codes. Together with a weaker yen making it a less expensive destination for foreigners and the international travel boom, Japan has become more and more popular among visitors from overseas. After six straight years of double-digit growth, Japan has become one of the ten leading countries worldwide, based on international tourism receipts in 2017. 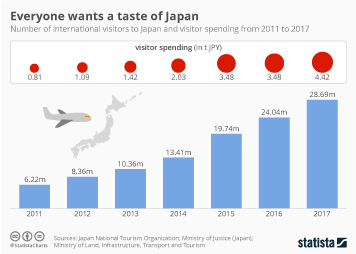 While the domestic travel market has been relatively stagnant in terms of tourist consumption value, inbound tourism has increased sharply due to an ever-increasing number of inbound tourists, accompanied by a rising value of foreign tourists’ spending in Japan. Although the hotel industry highly benefits from the tourist influx and lodging facilities enjoy high occupancy rates, the rising number of visitors also create problems: intense traffic and overcrowded trains and buses or residents complaining about noise or foreign nationals failing to abide by the local customs (e.g. waste disposal) are just a few challenges the government has to find feasible solutions for. Moreover, major tourist destinations, such as Tokyo, Osaka or Kyoto are often close to fully booked. To meet the government’s goal of an annual 40 million visitors by 2020, it is important to increase the supply of hotel rooms. In addition, municipalities and cities not yet as popular among visitors but having the capacity to accommodate more people have already taken initiatives to attract more travelers from overseas.